End of another weekend. Which was busy with cleaning, Octoberfest, Steed's Dairy Farm (it's a Fall thing around here that is geared mainly towards kids. We went in the corn maize though and holy cow.. it was harder than it looked!) and Fall Fest at our church. Now I am taking a break from homework and tending to the puppy. :/ Poor guy must have ate something that doesn't agree with him. So I am hoping tomorrow he wakes up feeling like himself again! 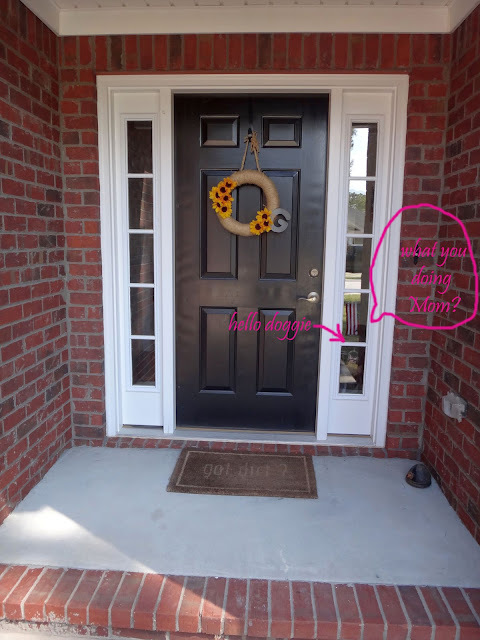 Now on to the OTHER entryway.. the front door! First off, can I say just how much I love our entryway? 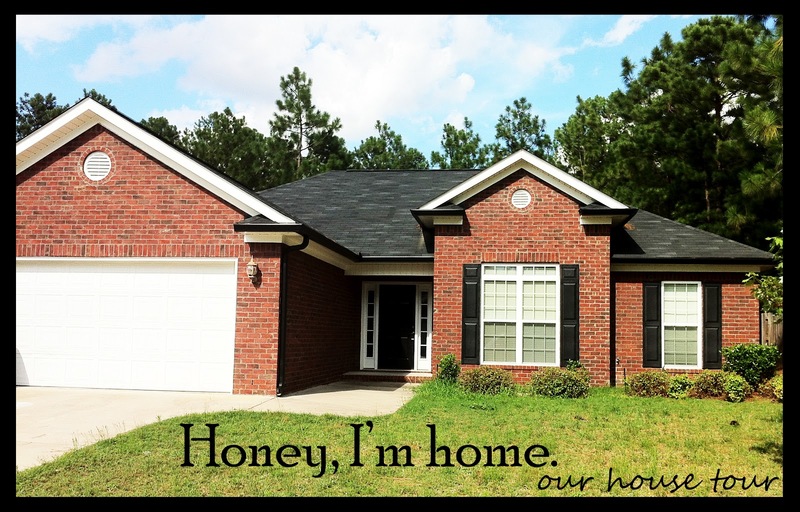 It is brick and cozy.. and recessed so if you feel like being a little redneck when it storms, you can stand out front and watch! Our "got dirt?" mat has been with us since our townhouse! It was one of our first purchases towards the house! Loving our wreath.. I found all the supplies needed at Walmart too! Took a plain wreath they had out for fall.. wrapped it in twine, added some sunflowers by cutting them towards the top and stripping the wrapping off the wire. Then I just poked the free wire through the wreath, painted a wood "G", wrapped twine around it and the wreath to secure it on. Braided some stray twine for a hanger and wallah.. 4 supplies, no glue and a year round wreath. I already had the EST 2010 letters from the apartment.. spray painted letters from Hobby Lobby. 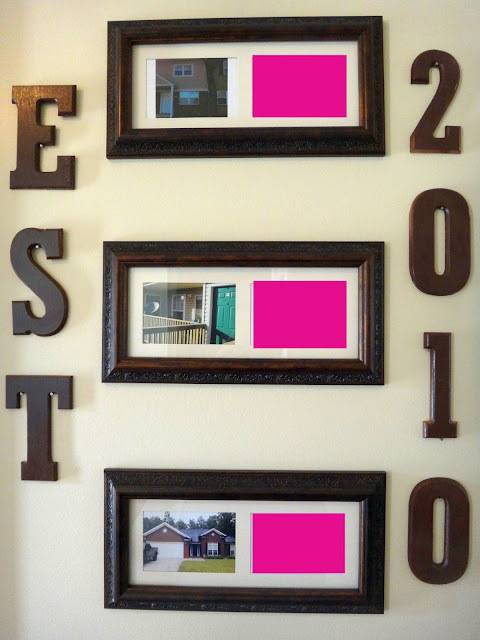 Just added some matching picture frames with an image of the house, and underneath the pink is the address associated. I had to pink box out the addresses! To the right of the door (left in these pictures) is the dining room. Which the dogs love for stalking watching the neighbors.. and napping. As of now this room is used for Klutch's kennel (the rest of it was being cleaned..) and possibly the future home of a either a pool table for Rob or a nice dining room table. Not sure yet which... either way I don't mind the empty. 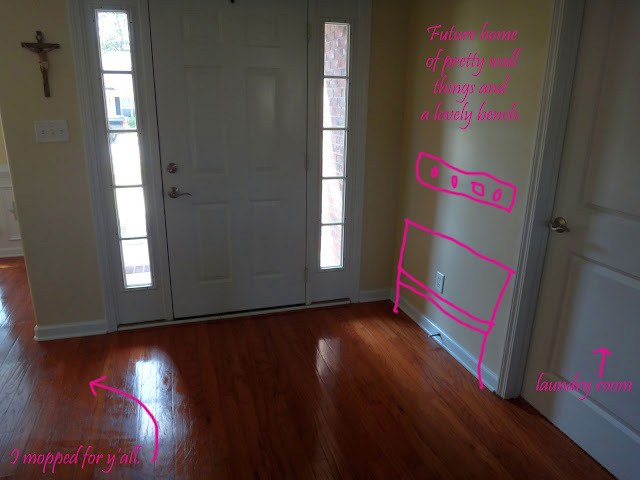 The entryway and the dining room are the only two rooms in the house with hardwood floors. Which actually works out perfectly. They are gorgeous.. the first time we have ever had them. But I will admit they are harder to maintain with dogs. So there you have it.. the first actual room of the house! Be on the lookout for the bathrooms, the guest bedroom, the office, the kitchen, the living room and the master bedroom sometime in the future. I love your entry way, the wood floor is beautiful! Ahhh hardwood floors. Gorgeous. 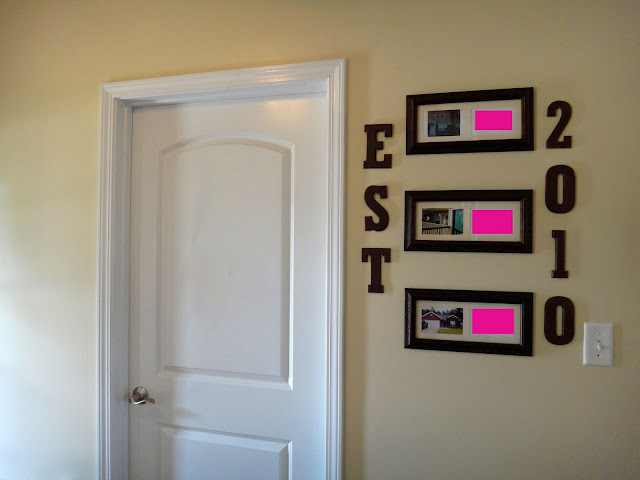 I LOVE, love love love the idea of pictures of each house you've lived in. I'm definitely stealing that idea. And I loooooove hardwood floors, although I'll agree- there's nothing easy about maintaining them with fur flying around. Can't wait to see your bench! And more rooms! Oh the anticipation!